Whether it means completing a FEMA project on time to ensure your cooperative doesn’t lose any funding or merely completing a standard work plan on schedule and on budget to prevent future plans from being affected, Vaughn Industries does it! 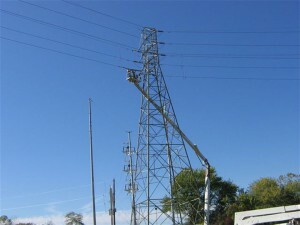 We repair, maintain and rebuild existing overhead and underground outdoor electrical systems. Our Transmission and Distribution division can also construct and install new lines, working with voltages from 120 to 345,000 volts. We have the experience to meet all of your Distribution needs. We work with energized primary electrical cables (up to 34,500 volts), the primary lines that distribute voltage from substations to the premises of customers. 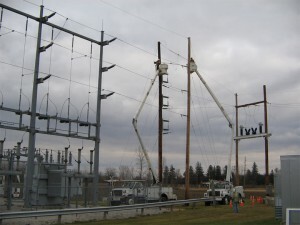 We are trained in high voltage work up to 345,000 volts, working on overhead transmission lines and installing poles of all types and sizes. We perform OPGW (Optical Ground Wire) installations, an overhead ground wire used in telecommunications on high voltage power lines. When emergencies arise or storms damage electrical systems, Vaughn Industries is available for restoration work. We are on hand 24 hours a day, 7 days a week. Just call 1-888-334-9776. Vaughn Industries has all of the specialty equipment necessary to provide exceptional services. We have bucket trucks of all sizes, enabling us to reach the height of any utility pole you might require. We have digger derricks to dig holes and set poles. We have rock diggers, cranes, all terrain equipment, as well as equipment specifically for excavation and trenching. Whether your project is large or small, Vaughn Industries is here to answer your needs!